This could be a season to remember down in Kentucky’s Red River Gorge. Some guy named Adam Ondra will be there shortly, and several big names are already on the ground racking up sends. Jon Cardwell is on his first trip there, climbing 22 5.13s on his first try and repeating Fifty Words For Pump (5.14c) according to his 8a scorecard. Daniel Woods is getting re-acclimated to the Red, sending Omaha Beach (5.14a) on his first try in 5 years (aftermath of the ascent above right) and making quick work of Southern Smoke (5.14c) and Thanatopsis (5.14a) according to his 8a scorecard. On the ground before she started, I gave her a few tips about which holds to grab but it was pretty much an onsight. That UKC article also says Cedric “unsighted” Omaha Beach. I don’t know if that means he climbed it with his eyes closed, or what. I’m not sure anyone needs to be surprised for it to be newsworthy: the fact is, V13 has been the sort of thing that only very strong adult men who work exceptionally hard and have a bit of genetic luck reach. The fact is, Ashima is the first to be accomplishing this, and it’s neat and noteworthy. And there is a disanalogy that makes it surprising (though, of course, not _inexplicable_ in the way your strawman finds it): the parallel bars are built for the average-sized gymnast, while the rock climbs Ashima is sending were put up by tall (to Ashima) dudes. The natural thought was: a little kid simply couldn’t reach between the holds. Ashima said “Screw that — there’s a bunch of tiny holds you guys never noticed.” That’s neat. I 100% agree that what she is doing is super impressive from an age perspective, a super young girl preforming at a top level. But, lets be real here, the climbs werent “put up” by tall dudes. The climbs were actually “put up” by the natural forces that shaped the rock. When ashima gets a pad and a half on the crux razor of some boulder problem, how exactly is she less fit to climb the route? It has been shown again and again that climbing is a tiny, skinny man sport. Look at the world cup, look at any crag, look in your local boulder field where the dude thats sending the v13 also looks like he is going to be blown away by a slight breeze. So why the argument that she is somehow at a disadvantage? Personally, id be way, way more impressed to see a 250 pound linebacker looking dude send the same problem. Why you gotta hate, son. Stop worrying about what kids can and can’t do and go do some rock climbing. honestly, just to be real about it, it’s true i would be super impressed if a 250 pound linebacker looking dude sent the same problem. but personally i would be way, way, WAY more impressed if a 500 pound linebacker looking dude sent the same problem. I believe his name is Jimmy Webb. I wonder the same thing, I mean it isn’t impressive – there are SO MANY CHILDREN climbing V13’s, it isn’t even noteworthy. To stand out she would have to climb 5.9 wide, then (and ONLY then!) will she get my due respect. I think Lachat is Swiss. The title reminded me of this comic. It will be interesting to see what routes get climbed and how quickly over the coming weeks. Ondra was out at the Lode yesterday and sounds like he OS Omaha Beach. He was asked what he thought of the climbing mid route by another climber in the Madness cave and responded that the climbing was big jugs down low and uninteresting up top. LOL. Welcome to the Red. Narc, where are the hourly updates and iphone videos? 2) It occurred to me when I thought about updating about Ondra’s first day that him onsighting a .14a is actually not remotely surprising or uncommon. You’re correct in that it’s not going to take him long to send everything worth his effort. It would be interesting to see if he looks at Sharma’s [speculative looking] line in the Drive By amphitheater. Or maybe he’ll find something else to bolt himself, even. 1.) You are THE Narc. You should have op’s in the field. 2.) 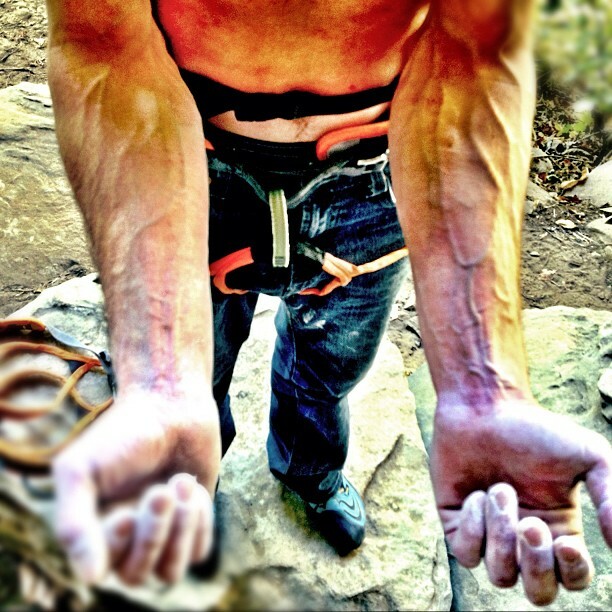 It is noteworthy when Ondra onsights 14a in our backyard. Everyone expects it, and wants to hear it confirmed. 3.) Yes sir, you are correct sir. Who’s ready for Southern Smoke Direct to see a repeat? That, Golden Ticket and Pure Imagination are the only established climbs out that way that I can imagine will provide him notable resistance. Could pure imagination become the first 9a flash..? Just because these routes see more onsights doesn’t mean they are easier than other routes of the same grade. It just means they are easier to onsight. The fact that they are power endurance routes is significant because the style of climbing is straightforward, not because it “can be trained for.” Any style of climbing can be trained for, and power endurance training in particular is not a new thing. It’s not like 14c/d takes him all that much effort in places like Spain or, well, anywhere. He just hikes that stuff. Even if he onsights 14d in the red, it’s entirely plausible he would do that somewhere else if he had decided not to visit Kentucky. Oh Jens is going to have a field day with both the flash and the downgrade! Happy, Happy Norseman today. He’ll be sure to miss that a new sequence was found for the start, but will maximize the bravety and humbility of the ascent.